(Feb. 2, 2013) It took her a while to get there, but once Laura Brooker hit the 50-goal milestone, it put her into history as one of four Laurier women’s hockey players to ever hit the plateau. 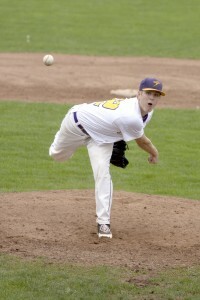 In less than three years, Brooker became an offensive threat for Laurier, helping them to their 2011-12 OUA championship. As the captain of Laurier in her fourth year, Brooker heads to Italy for the Winter Universiade. (Nov. 13, 2013) After an extensive construction process and the pushback of the opening date, the new, improved and refurbished fitness centre in the Athletic Complex had its grand opening on Nov. 13. The innovative fitness centre was a product of $5-million in renovations since Aug. 1, 2012. It was a long awaited moment for most Laurier students this year, as construction caused disturbances throughout the complex. (Sept. 21, 2013) The Western Mustangs have always been a perennial powerhouse in the OUA and were ranked nationally going into the game on Sept. 21. Having Laurier running back Dillon Campbell score a 100-yard touchdown in a game people presumed to be a blowout speaks volumes on the development of the Laurier football program this year. Campbell was a dominant force for the young Laurier offence as he rushed at least 100 yards in five of his eight games, and was named a second-team OUA all-star after leading the OUA in rushing yards with 867. (Oct. 11, 2013) The women’s rugby team qualified for the playoffs this season for the first time since 2005, winning their first game against the Brock Badgers on Sept. 28 by a score of 13-7. They had a regular season record of 1-4, but their one win squeezed them into the playoffs to take on the Guelph Gryphons. However, the Hawks could not take on the powerhouse Gryphons and lost in the first round of the playoffs 78-0. It came as a major shock to the athletics community that Laurier would not be bringing home a banner in 2012-13. For the first time since 1999-00, Laurier would not be a champion in any sport, with the closest finishes being the women’s soccer team who came second in the OUA championship, and a few swimmers qualifying for the CIS championships. The year featured a large group of rebuilding teams and a few early exits for some teams. (Oct. 4, 2013) On Oct. 4, Emily Brown showed why she’s a top forward by netting five goals in a single game, setting a modern-day record, against the Waterloo Warriors. Brown had struggled early in the year and exploded against the Warriors. The next day, she scored two more against the Windsor Lancers to bring her total to seven goals in two games. Brown was named Laurier, OUA and CIS athlete of the week for her performance. Her five-goal game was the end of a two-game winless streak for women’s soccer and the beginning of a three game winning streak that helped the Hawks solidify their playoff contention. By the end of the regular season, Brown led the OUA with 18 goals in 16 games and was named the OUA West MVP, an OUA first team all-star and a CIS first team all-Canadian. (Jan. 8, 2013) Michael Faulds came in to the Laurier football program as the sixth head coach in history. After Gary Jeffries stepped down in late October, the question of who would succeed him took over the Laurier community. 28-year old Faulds came in with an uncertain group and immediately took to work. But to everyone’s surprise, Faulds surpassed expectations. Laurier’s football program boasted a less-than-impressive 1-7 record, however were considered the “best 1-7 football team in the country” after continuous close games and at one point leading against the eventual Yates Cup champions, the Western Mustangs. Faulds would put up his first win as the Hawks’ bench boss on Sept. 14 in a 41-10 blowout against the Waterloo Warriors in a triumphant effort by Laurier. (Jan. 12, 2013) Men’s basketball head coach Peter Campbell still doesn’t know how Max Allin did it. Just nine days after his father passed away, Allin set a new Laurier modern-day record for most points in a single game with 43 points against the Guelph Gryphons. In just his second game back since the personal issues, Allin scored 43 of the 88 points Laurier put up that night and added eight rebounds. He was named the Laurier, OUA and CIS athlete of the week for his performance and went on to lead the CIS in scoring by the end of the year. (Nov. 3, 2013) At the beginning of the year, head coach Barry MacLean knew it was going to be a tough year. With a pile of rookies, no fifth-year players, struggles on offence and a lot of injuries plaguing the women’s soccer team, Laurier was not on the top of the OUA like they have been, and even fell out of the national rankings. But despite the adversity, Laurier finished second in the OUA West and went on to win the OUA championship in two consecutive penalty kick affairs — including knocking off the No. 1 Western Mustangs in the final. (Oct. 20, 2013) The Hawks soared to new heights this year as they brought home the first ever baseball OUA championship banner in Wilfrid Laurier history. The Hawks overcame adversity in an impressive performance this season, on the heels of a forgettable shortened season last year due to a four-game suspension for hazing. The Hawks also posted the most wins in a season in school history with 25, most games played in school history with 39 games played in 60 days and an impressive second place finish at the OUA/OCAA championships.